Ealing Street Pastors was officially launched on Saturday 19th July 2008 at a local Church in the London Borough of Ealing. Four (4) local churches then got together in the interest of taking the scheme forward. We have been successful in forging links with the Local Police and the Local Authority. 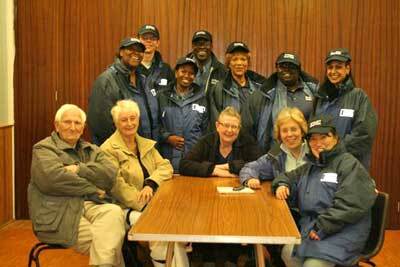 They see street Pastors as another useful approach to keeping the streets of Ealing safe. On Friday 9th October 2009 we were Commissioned into the Acton area of the London Borough of Ealing. A team of Street Pastors patrolled the Acton High Street area for the first time.We were welcomed by all the users of the streets at the time as 'a good thing'. We introduced ourselves to the Clubs/Pubs and were asked by users of the streets who we were and what we were doing; giving us the perfect opportunity to talk about our work and get feedback on what they though of us. It was all positive. Overall, we are excited that we can work in this Urban Trinity to help keep our neighbourhood safe whilst serving the purpose of God in our generation. Big Up to Street Pastors for such a splendid opportunity.